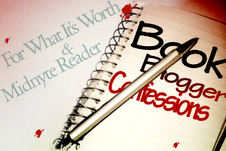 Midnyte Reader: Book Blogger Confessions - Special Edition! (Monday, April 28, 2013). Book Blogger Confessions - Special Edition! (Monday, April 28, 2013). Question: We have an extra Monday this month and thought we’d address some hot topics in the book blogosphere. Pick one – or answer them all! It’s up to you. If a new crisis hits by then (& it probably will lol) feel free to address that as well. ~Amazon buys Goodreads (Find the announcement here) Do you think this is a good thing for readers – or is Amazon the devil? Will this move effect you? Will you be leaving Goodreads? ~ The death of Google Reader As Google continues to phase out it’s less popular products, bloggers were scrambling to find a new reader platform to follow their favorite blogs. What have you switched to for a reader? ~The big fear though is the loss of Google Friends Connect. How are you preparing if indeed GFC is discontinued? How many subscriber options are too many to offer your followers? What ones are the most popular on your blog? Also, how are you preparing if GFC does go by the wayside? ~What do we owe authors? There are several schools of thought. Authors of course would like us to buy their books and promote them. And that's okay, right? I mean we do that! However, when people start to get pushy and expect bloggers to be publicity machines it can get a little...uncomfortable. My co-host Karen from For What It's Worth brought this post HERE to my attention. It originated from this post HERE about an author that tweeted if you get all your books from the library it deprives an author of income and another suggested using this graphic to help readers spread the word about a book. You can get lost reading these posts that link to other posts, but I wanted to present all the information. What are your thoughts on this? Do authors have a point or do they go too far with reader expectations? ~Amazon/Goodreads: I am pretty ambivalent about Amazon buying Goodreads. Some claim that Amazon is akin to the Evil Empire and I can see their point of view. Amazon has been instrumental in putting smaller bookstores out of business, Amazon doesn't just sell books, but other merchandise as well with competitive pricing. Not only that, but now they have their own publishing and fashion line. Parajunkee wrote a great post about it HERE. However, although I see the scheme, it doesn't bother me. I often buy from Amazon anyway. I can't afford to make a economic statement by NOT buying the cheaper priced merchandise from them. Do I think they're trying to take over the world? Perhaps. At least the online purchasing market. However, I don't think they will brainwash me, but maybe I'm being naive. To be honest, I really can't afford to go on spending sprees because of mind altering consumer tacticts. ~Google Reader: I never really used Google Reader to follow blogs. I have them in my bookmarks and I go down the list using that. Maybe it's not so efficient, but it's what I do. I did sign up for Bloglovin though and I am finding myself utilizing that. It's a platform I like. ~GFC: Yes, I admit it. If GFC goes away I will be very sad. So sue me. I can't help it. I like seeing how many people are on my little widget, even if they never come back, even if it's bogus, even if it is not really a clear indication of how many people are following my blog. There is just something validating and satisfying about GFC and I still get a huge thrill when I see a new follower. I'm not sure how many ways to follow is *too* much. I mean one reader may prefer a subscription by e-mail, while another prefers a GFC. I think it's okay to offer people different ways to follow. I do think that GFC will go away. First I will cry. Then I may finally make the move to Wordpress. Do you hear that Google?!!! ~Author Publicity: Wow. WOWWWW. For an author to dictate to their readership is mind boggling. Books are entertainment (in some cases educational), but basically, for me they fall into the same media category as movies and magazines. They are there for the public to enjoy. We don't have to read a book to live our lives, the same way we need to buy food. We read to enhance our lives. We read for pleasure and enjoyment. Is it our responsibility to pay full price for a book so that authors and the publishing industry can survive? Clothes get put on sale. Should we not buy from a sale rack or a store like TJ Maxx because the original stores (like Macy's or Nieman Marcus), designers and manufacturers are not getting the highest price they should? As a consumer we always try to find the best bargain we can. Otherwise, we may forego that pair of pants altogether. I've never heard of designers demonizing us for going to a thrift shop or demanding we rate their shoes. This actually is done already on several purchasing sites anyway. Maybe this isn't the best analogy because we definitely need to wear clothes, but we don't need to wear the nicest clothes on the racks, correct? I don't go to movies in order to support an actor's salary. I go because the story looks good or the actor starring has been compelling in the past. Again, I go to be entertained. If we all decided to stop going to the movies because we want to see the show for free on television (which we pay for cable anyway) and the whole motion picture industry crumbled would the Hollywood executives blame the public? Or would they find some other solution? Along the same lines THIS article about author Terry Dearey's views made me want to cry. Or scream. other entertainment do we expect to get for free?" he asked. I thought this was kind of appalling. My library is crowded every time I visit. There are plenty of people who utilize it for their (gasp) free services. There are plenty of populations that don't have computers or income for books, even in so called affluent areas. Libraries give nothing back? Really? Really? Look, I tell people in my own office who complain that they don't get paid enough for what they do that maybe they should consider another job. Simple as that. If an author is writing to "make money" they are writing for the wrong reason. Of course, that's just my naive starry eyed opinion. But if someone simply wants a job to make money consider medicine or law or something else lucrative. Again, maybe I'm naive but I thought writers wrote because they wanted to were compelled to tell a story. Seeing your book published is excellent, but the expectation that because you wrote a book you should be supported by the public is unrealistic. If you're writing and story exceeds our expectations it will happen. with me rather than try to poison me with spiteful remarks." Hmmm. How does he know he's not seeing poor people in libraries? Also, maybe he should go to a depressed socio-economic area and browse around the libraries there. Okay, so I don't really know how Mr. Dearey would change people's access to literature, but it does seem that publishing houses are certainly thinking about it with the rise of digital books. If libraries do go by the wayside or are drastically changed because books and magazines should not be free, (because let's face it NOTHING in life should be free), I think that there will be more bargain book stores, book swaps and maybe more organizations that give out books to promote reading (kind of like World Book Night). How about you guys? Do you have any feelings about the above topics? Don't get me started on the Libraries thing. Libraries and Librarians are awesome. I am "middle class" and yes I have started using my library card. No, I don't feel bad. More importantly, the more people who use the library the more likely they are to expand and get more of the community in their doors. Any way that you can encourage someone to read is never bad thing. @Felicia: That is so true! Because I read your book, I have to, what? Make other people read it? It's what I hope to do if I like it via my blog or word of mouth. What if I don't like it? Would an author want me shouting that from the rooftops as well? That's promoting too. I think these expectations come from the marketplace and publicists...and authors realizing they have to be their own advocate. Well that's true and all well and good, but promoting your book and pushing your book can be very different. And I've been in love with libraries since I was old enough to walk. My library card is my most precious item in my wallet! *shakes head at Deary* Glad you felt the same! Does he not know anything about modern classes? I mean, seriously... The Poor class. Totally. If that's what he sees in his library he needn't abolish them, he needs to just change it- libraries are accessible for those that are less wealthy. Or anybody who doesn't have all the money they would need to fund a crazy reading habit. Does he want to cause more offence? Middle class (if we're using that term) would deserve community just as much. If they feel comfortable having their arms stuffed with books then I commend them. I agree with your opinions on all the topics though & agree that people have the right to follow in the way they prefer. I try & have different ways I am comfortable in exploring on my blog. I'm sure there's no issue with that- I mean... I don't think my followers are peaking. Standstill at about 80 followers? I hope not XD Yours won't be at a standstill even at over 7 times that, lol! "The libraries are doing nothing for the book industry" That statement just make me sad. It's tough for authors to make a living at this profession. So much is completely out of their control so I understand their fear but every single author I've ever met has been supportive of libraries and librarians so I'm hoping that is just a very small, minority opinion. When I switched to wordpress I was incredibly sad about GFC and then suddenly... I wasn't :D It hurts at first but it will be ok. I think everyone who has/had a blogger blog feels like that at some point. I love your posts on authors/libraries... I agree with everything and I love how you compare it to clothes. It's just so true. While I don't like some of the rotten things that Amazon has done in the past, I don't think that they're the Evil Empire. I'm just keeping my fingers crossed that they don't ruin Goodreads by cross-promoting their books or anything. And I want to keep ownership of my reviews too thank you very much! I really like your clothes analogy! If authors don't like libraries, I guess they don't like used book stores, thrift stores, or garage sales either. So far as I'm concerned, they should be happy anyone is reading their book, no matter how they got it! A fan is a fan, right? Googles G+ push wasn't the biggest reason I decided to move to WordPress but it was definitely a factor because I absolutely hate G+ and I hate even more that they are forcing it on me. Those quotes made me so angry! I can't believe he compared readers to looters! I don't go to the library often but whenever I go, and to whichever library I go to, it always got people in it. I really liked your comparison to buying clothes because that is so true! I buy tons of things that are discounted and I don't feel the least bit bad about it. I work hard for my money! Quote: "There is just something validating and satisfying about GFC and I still get a huge thrill when I see a new follower." How true! Though it isn't a real indicator of a blog's wealth, so to speak. But still. Anyway, it's easy. One doesn't have to search for other options. On the other hand, if someone is not on Blogspot, there must be another way for that person to follow me - other that following by email and/or simply bookmarking, that is. But any other way amounts to open yet another account :(. And, for instance, I'm sure I'll have to take a day off just in order to hunt for info and experiment with blog aggregators! Quote: "I've never heard of designers demonizing us for going to a thrift shop or demanding we rate their shoes." LOL! I actually had to laugh out loud at this point - and no one was even around to hear. Great analogy! I should go on and quote more chunks of your article - but I'm lazy haha (no, really. I've just spent like 3 hours involved in the exchange-comments game, so I'm just a little tired!). But it is so largely quotable, be assured of that ;). Quote (Amy Bookworm): "Does he not know anything about modern classes? I mean, seriously... The Poor class. Totally. If that's what he sees in his library he needn't abolish them, he needs to just change it- libraries are accessible for those that are less wealthy. Or anybody who doesn't have all the money they would need to fund a crazy reading habit. Does he want to cause more offence? Middle class (if we're using that term) would deserve community just as much."